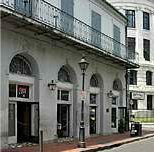 A keen eye and quick list can unveil the salient patterns of French Quarter building types. 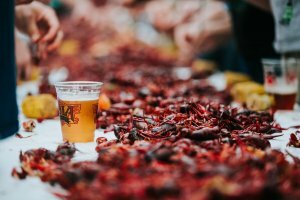 Most antebellum sorts come in “Creole,” “American,” and a mix of the two. Those built after the Civil War and later are generally “Eastlake,” or sometimes “Craftsman” cottages. There are subtle but fundamental differences among the types, and one must watch for variations not in “style” or décor, but in roof framing, massing, and floor plan. The entrance to a building is a clue to its original inside arrangement. Public monuments on the Square include the Cabildo, begun in 1795 as a Spanish town hall in modified Baroque style. 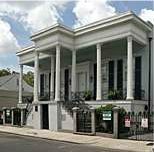 The Presbytere or priests’ home is similar but, not completed until 1813, it was used as a courthouse. Both were built with Renaissance-style roof balustrades, the Mansard roofs being added in 1847. St. Louis Cathedral, built to designs of French architect de Pouilly, was begun in 1849 and is the fourth church on the site. 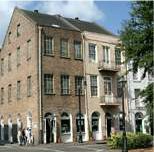 The flanking Pontalba Buildings consist of two long rows of Creole townhouses, built by the Baroness Pontalba in 1849 to embellish the square and increase her rents. 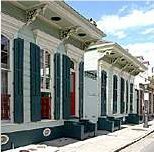 The Creole townhouse took shape after fires of 1788 and 1794 removed the town’s freestanding French Colonial houses. These late Spanish years saw the rise of the tall, narrow, three-story brick house, set at the side walk or banquette, with three bays or openings, all doors. Inside the family entrance, but exterior to the shop, the house has a ground-level flagstone passageway leading to a loggia in the rear with curving stairway. This is sometimes reached with a porte-cochere or carriageway. Stairs are never in a hallway. Outside doors are tall and surmounted by arched and barred transoms. Above them one should note the narrow second-floor balcony, just two or three feet deep and supported by scrolling brackets of hand-wrought iron from the forge. The cast-iron “gallery” of later vintage is different–wide and supported on columns, all cast from molds in commercial foundries, not from mom-and-pop blacksmith shops. These were frequently added in the 1850s to houses first built with balconies in the 1830s. 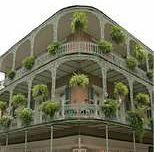 One may occasionally find a balcony oddly high upon the façade, as at Bourbon and Bienville (Old Absinthe House) or Royal and St. Louis (Vieux Carré Restaurant), or Chartres and St. Louis (Maspero’s). 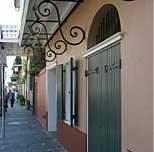 These are examples of the enigmatic, interesting “entresol house,” special cases of the Creole townhouse. With a short middle level or “entresol” between the shop and the residence that was used for stock and storage, these mezzanine spaces get light and air from extra high, arched and barred, first-story transoms. They were an experiment with full-service vertical living in the growing 18th century city. 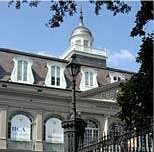 The American townhouse looks like the Creole, but has an interior stair hall, post-and-lintel openings, and may have a five-bay center hall façade as at the Xiques House, 521 Dauphine. Dating from 1825 to the Civil War, they always have late Federal or Greek Revival ornament and are found in superb rows with cast iron galleries. The American-style store has heavy granite columns and lacks an upper residence and thus a family entrance. The “corner store-house,” whether cottage or townhouse, has a beveled corner doorway, but keep an eye for the subtle family entrance with molded door surrounds on a side wall. Watching for these features will make Quarter sightseeing more readable for newcomers. 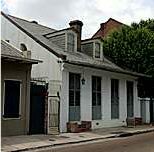 The vigilant Vieux Carré Commission has jurisdiction over exterior walls, both front and rear, which preserves a fairly high level of historical accuracy in French Quarter streetscapes.